Today, at the Where 2.0 Conference in Santa Clara, man-about-town Robert Scoble spoke with Foursquare Co-founder Dennis Crowley about future plans for the hot location-based service. According to Crowley, the future of Foursquare is going to focus squarely on what its users are going to do, not what they are doing. See what I did there? It’s all well and good to track the realtime movements of its more than 8 million users, but the startup wants to make use of the loads of data it’s collected on these realtime movements (600 million check-ins in the last year) to help users plan what they should do next. Foursquare gave its users a brief glimpse of this in its Explore tab, which it introduced last month. The Explore tab allows you to tell Foursquare what you’re looking for, be it a restaurant or movie theater, and the app will help you find the closest alternative — basically it’s a Foursquare recommendation engine. It bases its recs on where you’ve checked in, where your friends have checked-in, your loyalty stats, and so on. Interestingly, Crowley specifically mentioned Ditto as something he’s intrigued by. Ditto is an app that goes beyond the present check-in to give recommendations to users and help them plan something to do in the future. It’s pretty cool — just ask MG.
“Future check-ins are one of these things we’ve wanted to do for a while. We’ve been focused on the present tense; we have just gotten there.” Foursquare has been almost laser-focused for the last few years on the so-called present tense, and some were beginning to wonder when the company would lay out its innovative future roadmap for check-ins and location-based services. Or would its merchant platform become the true future focus? To make future check-ins more automatic, Crowley said that the company is looking to build in background location, so that it naturally recognizes where you are and doesn’t require you to do it yourself. A daunting task, to be sure, but one that could help push Foursquare well beyond the growing competition from the likes of Facebook and Google, among others. The co-founder said that he believed Foursquare was well positioned in respect to its competitors because it is focused “on the relationship between people and places”, which in turn has led it to avoid moving into check-ins in TV shows and other entertainment media. 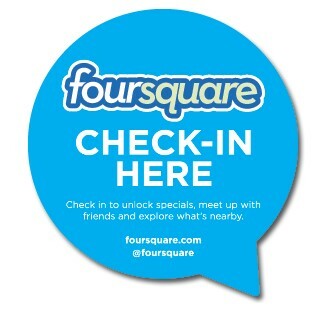 So, in the end it seems that the story of check-ins is just beginning to unfold, and Foursquare plans to be near the front of the pack.